Despite weeks of attempting to change their minds, members of the state Senate are expected to vote today on whether to confirm the current administrators of the state Ethics and Elections Commissions. The vote comes after a Department of Justice investigation was released late last year into a leak of information from a secret John Doe investigation that targeted Governor Scott Walker’s campaign and conservative groups. While the investigation did not identify the source of the leak, it found it most likely came from the former Government Accountability Board – an agency both Elections administrator Mike Haas and Ethics administrator Brian Bell worked for. Due to their past connections, Republican senators have questioned whether the two can remain impartial. Bell and Haas have spent weeks defending their records and have the unanimous support of the commissions they represent. They have also asked that their nominations to head up the agencies be given a public hearing – a request GOP leaders have refused to grant. Haas, who was head of the elections divisions under the old GAB, has argued that he had no real connection to the John Doe investigation other than working on some legal briefs. Bell, did not work on the investigation and has even said he left the GAB in 2015 because he disagreed with some of the partisan influences within the agency. The Ethics Commission also released an investigative report Monday into Bell’s conduct, which was done at his request, which found there was “not a scintilla of evidence” he has been partisan with his decisions. Republicans hold a majority of seats in the Senate, but the outcome of the confirmation votes for Haas and Bell still remain unclear. 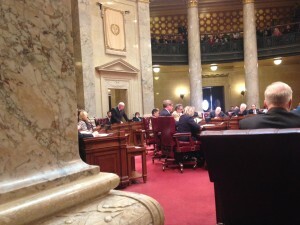 While Majority Leader Scott Fitzgerald has previously said he doesn’t believe either has the votes needed for confirmation, there has been some indication that at least a few lawmakers are undecided heading into Tuesday’s vote. If rejected, Elections Commission Chairman Mark Thomsen has insisted that only the members of the bipartisan commission that oversees the agency can actually fire Haas, and it will require a lawsuit by the Senate to remove him. Bell, on the other hand, has said that lawmakers rejecting his confirmation will mark the end of his work at the agency.